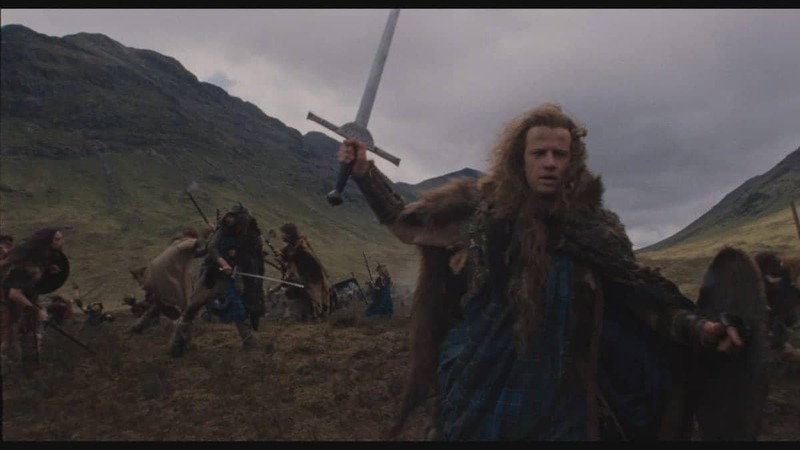 Highlander is another one of those films that a generation of people swear don’t get made anymore, despite the fact the distribution of such quirky films has been altered and that brand awareness and fandom have helped smooth out the rougher edges of more fantastical, commercial filmmaking. Through the jaded eyes of a younger viewer, it’s easy to pick the flaws of a feature such as Highlander. It’s an inherently silly film with a clear view of concept and style over anything else. It’s baggy and holds a half-baked mythos that takes quite a while to actually take off. Despite this, Highlander comes from a very earnest place. Stemming from a burning ambition to place a certain vision on screen. This 30th Anniversary reprint only highlights that it’s cult following, clearly gained and understood the film’s aims. In comparison to the mega franchises which suffocate multiplexes in the current era, the quaint sincerity of the enterprise ensures that the film retains a liveliness that’s sorely lacking in many present day studio films. Of course, this is easy to say when 30 years removed from a film, while modern day filmmaking technique has improved (something to note when looking at Highlander’s dated, yet kinetic action set pieces). However, Highlander’s sloppy backstory (why are their immortals? Doesn’t matter) often feels more rewarding over the meticulously planned franchise movies we are now subjected to. There’s an element of risk and chance that still emanates from Highlander that has ensured a vibrancy over the calculated commercial properties of recent summers. Russell Mulcahy doesn’t get as much love as George Miller, yet watching Highlander shows us of a director who holds the same rambunctious spirit as the man who made Mad Max. Mulacahy takes Gregory Widen’s already outlandish screenplay and ingrains the film with dynamic energy. A prominent music video director before moving to film, the director took his tools of the trade along with him for Highlander and creates a film full of distinctive imagery. From swooping crane shots, to watching Christopher Lambert’s Connor McCloud realise his immortality by walking under water. Sure it’s pure style and concept over anything else, yet even now there’s still a great pleasure in watching how the film plays out. Highlander is still clearly a product of its time. From it’s with a wrestling match opening featuring the Fabulous Freebirds, to the melodic voice of Freddie Mercury describing what’s occurring on the screen. The films training sequences can’t help but remind you of the campiness of Rocky VI (1985) It’s all very 80’s, and much like The Adventures of Buckaroo Banzai (1984), it’s also set to capture a certain type of viewer’s imagination. Christopher Lambert’s stiff performance will only suggest to some that it’s conscious act of a secretive immortal. The unbelievably Scottish Sean Connery plays a Spaniard whose lived in Egypt for hundreds of years? He’s training the clearly French-Canadian Lambert, who plays a Scotsman in this? It’s the type of folly that cult fans would lap up. Extras: This package is loaded with solid extras. It features up to date interviews with both Lambert and Mulcahy as well as deleted/extended scene which are sorely missing the audio needed which would make them essential. The gem of the set, however, is the feature length making of which details the crew’s thoughts on the film’s creative process. In the age of streaming, documentaries like this are becoming more scarce so to have a detailed extra like this on physical media is always welcoming.